The South East Wetland Carers Network (SEWCN) and Conservation Volunteers Australia has invited internationally renowned wetland ecologist, Geoff Sainty to share his knowledge and experience with interested members of the community. Geoff is an industry leader in wetland ecology and wetland design and management, as well an author of leading wetland publications for Eastern Australia. Geoff will introduce workshop participants to Coastal saltmarsh. Coastal saltmarsh is an intertidal community of plants that have historically been undervalued and considered by many to be boggy swamps of little practical use. As a result many of our saltmarsh areas have been drained reclaimed or degraded and coastal saltmarsh is now listed as an Endangered Ecological Community in NSW. However our knowledge of saltmarsh communities has greatly improved over the past few decades and saltmarsh are now known to be significant ecological communities that provide food and habitat for fish and other animals as well as being a ‘carbon sink’. These workshops are entirely field based, meaning participants will get a firsthand look at various wetland health indicators, such as vegetation condition, hydrology and impacts on the wetland systems. Geoff will offer some great insight and advice for the protection and restoration of saltmarsh and wetland areas.. This workshop is part of the ongoing SEWCN program; a partnership between South East Local Land Services, Conservation Volunteers and Wetland Care Australia, the program is funded by the Australian Government. 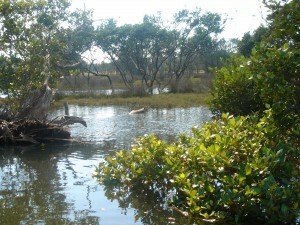 The project aims to protect and restore 1000ha of coastal wetland which act as biodiverse carbon stores, as well as establishing and maintaining connectivity to riparian and floodplain systems over the next 2 years.